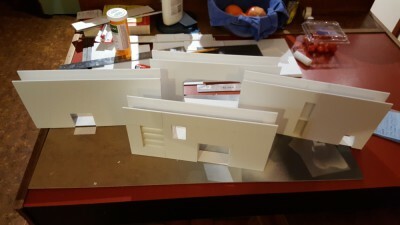 I’ve posted a test print of some printed space station walls previously but after finding a nice batch of Sintra (1/8th foamed PVC plastic board) in the offcuts bin at my useful local plastic supplier I decided to start that project with some larger, more space-consuming pieces and started building a set of six big wall modules. 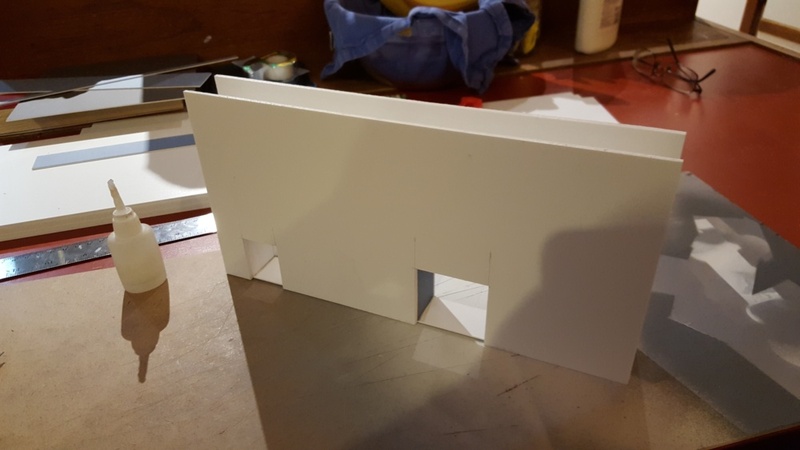 These are 12″ long, 6″ high, and designed as hangar or cargo bay walls. Six of them plus a couple of pillars will allow me to section off a 2′ by 2′ area of table, run a line of wall clear across the table, or do a number of other interesting arrangements. I’ll also do a few end-cap pillars so we can have stub walls if desired. 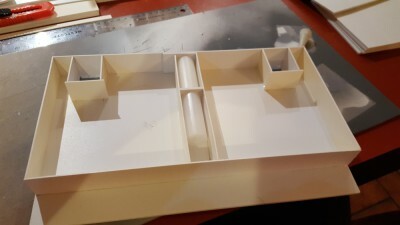 The design incorporates an “access tunnel” across the top of each wall that is 30mm wide and 30mm deep; there will be hatchways on each wall module to access it. I wanted to provide alternate ways of getting around the table and give players options for moving through the walls aside from the doors. Similarly, each module except the one with one single huge 6″x4″ door has at least two doors in it. Doors are always going to be chokepoints in scenery like this, there’s no avoiding that, but at least with multiple doors and hatchways per module that effect is somewhat limited. 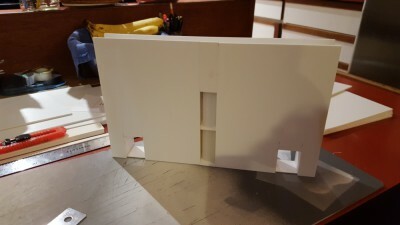 First wall – 6″x4″ huge door. Click for larger. Second wall, just two human-sized doors. Click for larger. 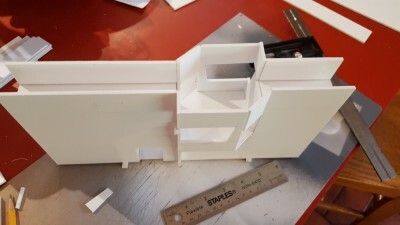 Third wall, interior construction. Two doors and some engineering bits. Click for larger. Third wall finished. Click for larger. Fourth wall, with a second-floor human door, a larger cargo door and ground level, and some more engineering detail, and the other three in the background. Click for larger. Fifth wall; this one has a ground-level human door and a second-level control room, with ladders down from it on both sides still to be installed. Click for larger. Basic construction is done on five of the six modules; the sixth is going to be a variant of the very first, with a huge 6″x4″ door in it. 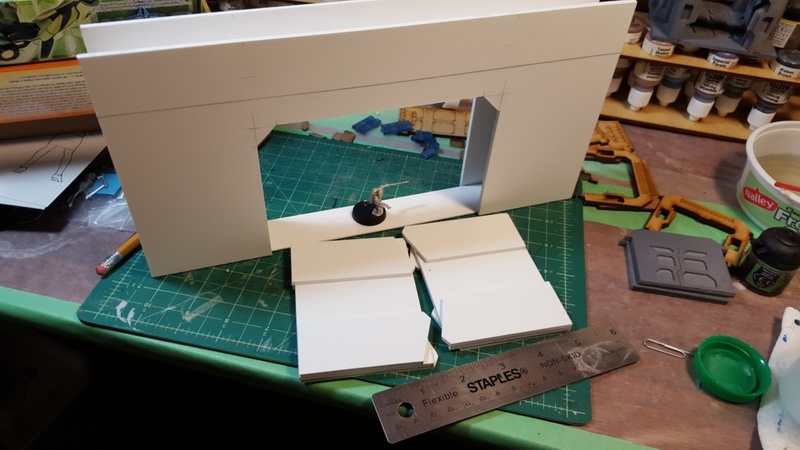 All of the large doorways will have built-in sliding doors installed, and I’m planning some freestanding doors on small stands for the human-sized doors. After that it’ll be on to the more human-scaled portions of the space station terrain, but this is a good start!